Game of Thrones Season 7 Spoilers: Till now there is no direct mention of Snow Bear in the series of Game of Thrones. But book of A Song of Ice and Fire shows some significant clues about one of the most awaited character in GoT. According to the novel, snow bear can be found beyond the wall, in the far north. We are pretty much sure that there will be an Ice Dragon but there are no clues for Snow Bear in Game of Thrones Season 7. They love being in the cold climate and usually bigger than polar bears because of their dietary habits. The size of an actual snow bear is described at least 13 feet tall in the books, which could be around the size of giants. The giants, who had helped Jon Snow during the first war with the white walkers assumed to be master of Giant Snow Bear according to some spoilers. The common difference between a polar bear and a giant bear can be easily figured out using the theory of direwolves. Direwolves are usually bigger than the size of actual wolves and much stronger than them. A direwolf can kill almost 13 men at once. We all fans are well aware about Shaggydog and his interaction with Bran Stark. Lord Commander Jeor Mormont better known for his egoistic and stringent behaviour was once informed by a ranger about a fifteen feet tall bear. The claim was duly refused by the Lord Commander. It was Jeor’s dream to see Jon succeeding him as the new Lord Commander of the Night’s Watch and it does came true. Books depicts a clear contrast when Jeor was informed about the bear, he was frightened but decided not to believe. White walkers also has an ability to reanimate the dead snow bears into wights. Its a well known quality of the white walkers and they had done the same with many animals including horses in the show. The major clue of white walkers were seen when the army of whitewalkers marched by Samwell. There were sounds all around when the army was arriving and Samwell hide behind a rock. Suddenly as the night king arrived on his horse, sounds changes. It could be a possible shot where we had heard about the snow bear but there no clues of it. Giant Snow Bear has a chance of coming in next episodes of Game Of Thrones. But we are pretty much sure that case of Ice Dragon will be more interesting. The case of Snow Bear is quite interesting but we don’t think David Benioff will give any place for the bears. The Season 7 will be primarily focussed on building alliances on the both of sides of the wall for war. Rest we can assure there is no official declaration about snow bear in Game of Thrones and it could be pure rumor. 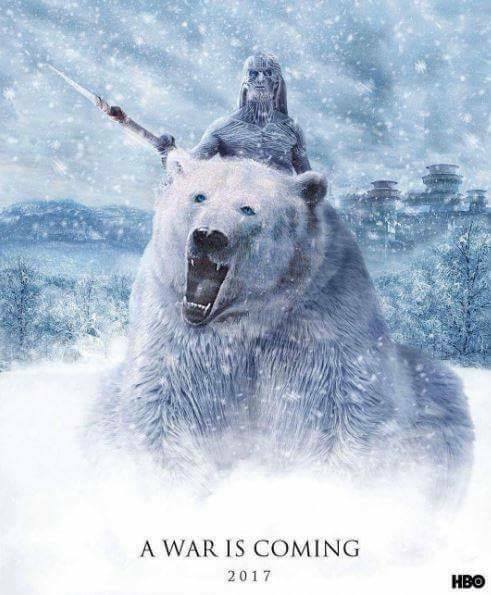 Do you want the Snow Bear to be introduced in the upcoming season of Game of Thrones, Let us know in comments.